In most of the towns, the railway over bridges (trestles) are generally an ugly sight. 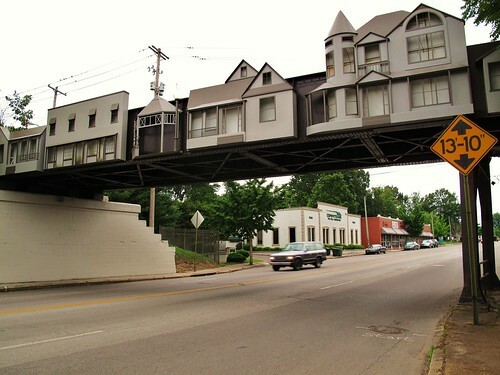 However an enterprising community in Cooper-Young, Memphis, USA has converted one such abandoned steel structure into a show piece. 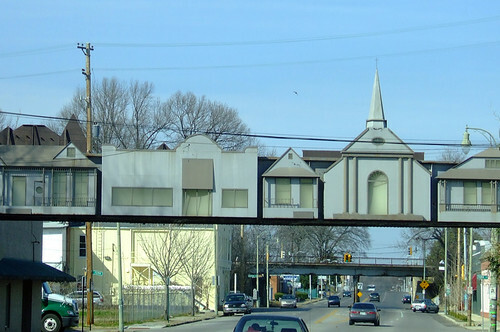 Cooper-Young is a historic district in the Midtown section of Memphis, Tennessee. The entrance to the neighbourhood is marked by the Cooper-Young Trestle, a 150-foot (46 m) long steel sculpture. At the initiative of community members, Jill Turman, a local artist designed and built, on both sides, steel compositions which are based on actual buildings in the area thus transforming the unsightly structure into a piece of art. The sculpture was dedicated in 2000, and has become a source of community pride and identity. Wish there were more such communities/civic authorities in the World.